Last month I read my first Morgan Matson novel. Then a second, followed by another…and well, I had to stop there since her fourth isn’t due out until next year! Back in early October, after a long run of thriller and ‘darker’ tales I felt it was time for a change. 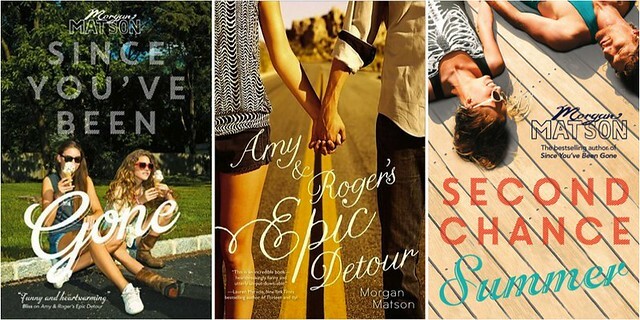 I was on the lookout for something a little bit different, and that's exactly what I found in Matson’s trio of contemporary YA novels. My Matson read-a-thon kicked off with Since You’ve Been Gone (2014), her most recent release and, if I may say so this early on in the post, my personal favourite of the bunch. The novel follows Emily whose best friend Sloane disappears at the beginning of the summer, leaving behind a to-do list filled with things Emily would usually shy away from. With her best friend gone, Emily decides to tackle the list and the novel takes us along for the ride. The characters in this one really won me over (something I would later come to find was the case in all three novels) and I adored the concept. After finishing, and very much enjoying, Since You’ve Been Gone I took straight to Amazon in search of similar reads. When I saw Matson’s debut, Amy & Roger’s Epic Detour (2010) was just 99p I quickly pressed the ‘Buy now’ button and started reading the book later that same day. Although the title characters haven’t seen each other since they were kids, they are forced to head out on a road trip together when Amy’s mother decides to pack up and move across the country. With Amy still concerned about getting back into the driver’s seat following a car accident, yet being the only one left to get the family’s car out to their new home, Roger steps in to help out. Both feeling a little lost, they decide to take a slight detour which turns into, as the title suggests, a pretty epic one. Despite never having been on any road trip adventures myself (that's one for the to-do list! ), you always know they're going to make for interesting stories full of adventure and I loved following Amy on Roger on their unique journey. This past weekend I finished reading my third Matson novel, Second Chance Summer (2012), which tells the story of Taylor’s summer break in Pennsylvania. After her father is diagnosed with a terminal illness and given just months to live, the family decide to cancel all of their usual summer plans and head out to their lake house, where Taylor hasn’t set foot for five years. The last time she was there, things didn’t end so well and to her surprise she’s about to run into some familiar faces. The theme of second chances carried right throughout the novel and once again there were lots of lovable characters to meet along the way. Whether you enjoy contemporary tales when it comes to YA and haven’t yet picked up any of Matson’s novels, or like me you haven’t really delved very far into this genre in the past, I would definitely recommend any of these novels to get you started. Morgan Matson’s next novel titled The Unexpected Everything – the tale of a politician’s daughter named Andie - is due for release next year (and is available to pre-order now! ).